Peak Pressure Washing in Apex NC, proudly provides residential and commercial pressure washing & power washing services to residents of Knightdale NC. Because we understand that the outside of your business or home, making sure it is clean is important for making a good first impression. We provide a low power pressure washing solution that will not only keep your home clean, but it’s environmentally friendly. We start with by coating the exterior of your business or home with a soap solution that will remove the toughest dirt, mold, and grime, but this eco-friendly chemical will not damage the wood, stucco, or other siding material on your home. Once this has been applied, we rinse the exterior with our low pressure power washing system and make sure that your home is clean and beautiful. No matter what your Knightdale pressure washing project needs are, Peak Pressure Washing is up to the job. Contact us online or by phone for a free estimate. Over the course of the year your roof gets exposed to different temperatures and weather. Dead leaves, mold, pollen, fungus, and other substances can start to become a blemish on your roof. Cleaning your roof by yourself is hard and can be dangerous without the right experience and equipment, that’s why if you need roof cleaning and live in Knightdale NC, you should contact the experts at Peak Pressure Washing. We use a low power pressuring washing system to make your roof look beautiful without damaging your roof. 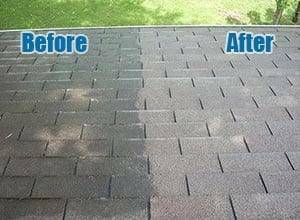 That way you don’t have to take the time or hassle to remove stains and unwanted blemishes on your roof, all while having the peace of mind that your roof looks like the day it was constructed. Contact the roof cleaners at Peak Pressure Washing today! Parking areas, walkways and driveways often times are constructed with concrete or masonry, if you own a home or business in Knightdale NC. Because these areas have high foot traffic and vehicle traffic, there’s a good chance they will get stained by oil, rust, grease and other substances. Peak Pressure Washing has the pressure washing and power washing services you can count on to remove the toughest stains from your concrete or masonry. We will restore these high traffic areas to their original beauty without damaging them in the process. Contact us to find out how we can help. If you live in Knightdale and have a deck or patio that needs to be cleaned, it’s important to find a pressure washing company that uses a low power pressure washing system. Because many decks are made of wood and have a stain coating, it’s important to make sure that the company you choose takes care not to damage your deck or patio when they are cleaning it. 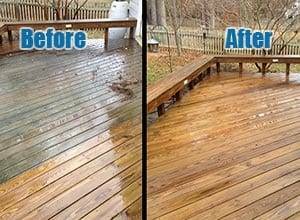 Peak Pressure Washing provides the best patio cleaning in Knightdale, contact us for a free estimate on getting your deck or patio washed. Clogged gutters can happen during storms, spring pollen season, and of course when the leaves fall in Autumn. If you need gutter cleaning services in Knightdale because your gutters have become clogged or dirty, contact the experts at Peak Pressure Washing in Knightdale. We proudly offer residential and commercial gutter cleaning and gutter face cleaning to homes and businesses in Knightdale. 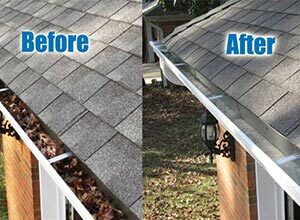 Our pressure washing and gutter face washing services will leave your gutters sparkling and without any damage. Contact us for your free gutter cleaning estimate in Knightdale today. 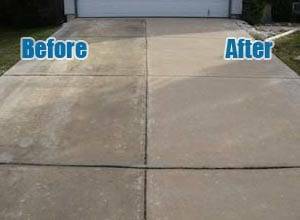 Are you looking to utilize our pressure washing or power washing services in Knightdale? If so, fill out the form below and we’ll get back to you as soon as possible. Peak Pressure Washing provides commercial & residential low pressure power washing, deck cleaning, concrete washing, signage and awning cleaning, gutter cleaning and more in Knightdale and the entire Triangle area. Peak Pressure Washing is your source for commercial & residential low power pressure washing services. 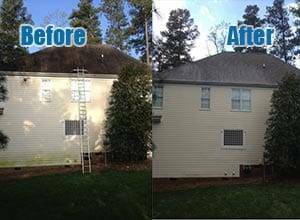 We proudly offer our pressure washing & power washing services in Knightdale Fuquay Varina, Cary, Apex, Raleigh, Holly Springs, Wake Forest, Clayton, Durham, Garner, Morrisville, & beyond.